Barbed Wire Fencing Is Durable, As Well As Affordable! Here in Texas, we’re no strangers to the many uses of barbed wire fences. 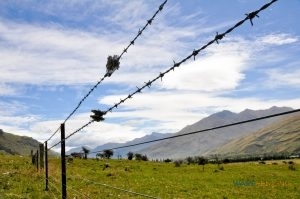 In fact, barbed wire is one of the most used fencing types for farm and ranch properties. Made from clusters of sharp spikes placed along an extended length of wire, this invention has been around since 1868. Originally, barbed wire was so sharp, ranchers referred to it as ‘vicious wire’ due to the injuries it caused to people and livestock alike. 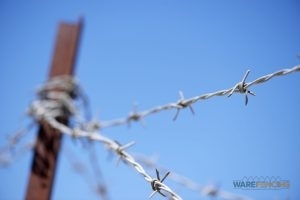 There are different variations of barbed wire to choose from today, and at Ware Fencing, we are proud to offer barbed wire fence repair, as well as barbed wire fence installation in Crowley and Fort Worth, TX and the surrounding areas. If you’re interested in learning more about our farm and ranch fence services, click here, or give us a call at 817-948-4503 today! Perfect For Marking Property Lines, As Well As Containing Livestock. When it comes to fencing in large portions of land for a reasonable cost, the number one option on the market is barbed wire fencing. In order to cut costs, many property owners believe that they can lower these costs by installing the fence themselves. Here at Ware Fencing, we are professional fence contractors, and we have years of experience. If you’ve never installed a fence, and you intend to make barbed wire your first fence installation, you may be surprised at how difficult, dangerous, and time-consuming it will turn out to be. Barbed wire is not only covered in sharp barbs but also incredibly tricky and difficult to work with. Attempting to install it over acres of land by yourself may end up costing you more than professional installation when you calculate the time lost. Additionally, as professional contractors, we buy our materials in bulk, and suppliers often hike up prices when they sell directly to individuals. Our contractors are expertly trained in barbed wire fence installation, so with our guys on the job, you can rest assured that you will be left with a durable, reliable, and effective barbed wire fence. Barbed wire is an excellent choice for marking your property lines, as well as keeping your livestock safely enclosed. You can rely on barbed wire fences to withstand extreme weather, as well as the tests of time. If you are interested in learning more about our professional and affordable barbed wire fence installation in Crowley and Fort Worth, TX and the surrounding areas, give us a call today at 817-948-4503 to get started!